The original iPhone (1st Gen.) is a handheld device combining mobile phone, iPod, and Internet communications functionality. It is a Quad-band GSM capable phone -- 850, 900, 1800, and 1900 MHz -- and features a 3.5" display with 320x480 resolution at 163 ppi, 4 GB, 8 GB, or 16 GB of flash memory (4 GB model discontinued September 5, 2007, 16 GB model introduced February 5, 2008), built-in support for Wi-Fi (802.11b/g), EDGE, and Bluetooth 2.0, as well as an integrated 2.0 megapixel camera all packed in a stylish case a mere 0.46 of an inch thick that weighs 4.0 ounces. Although initially announced as providing "up to" 16 hours of audio playback and "up to" 5 hours of "talk, video, and browsing", on June 18, 2007, Apple boosted these numbers to "up to" 8 hours of talk time, 24 hours of audio playback, 7 hours of video playback, and 6 hours of web browsing. It provides "up to" 250 hours of standby time. Perhaps most notably, the original iPhone introduced a "multi-touch" interface that allows one to control the functions of the system by dragging one or more fingers across the "optical quality" glass display. The original iPhone also has an accelerometer that allows the device to "know" whether it is being held in portrait or landscape mode and switch automatically, an ambient light sensor to adjust screen brightness based on need, and a "proximity sensor" to turn off the display when it is held to the ear. Photo Credit: Apple, Inc. Self-describing any product as "revolutionary" is gutsy, if not arrogant, but the iPhoneoffers an impressive patented "multi-touch" interface that allows one to control the device by sliding one or more fingers across the touch sensitive display. Effectively, the iPhone screen acts as a far more advanced version of the "Scrolling Trackpad" first introduced on January 31, 2005 in the PowerBook G4 series. The iPhone also has an accelerometer -- most likely based on the "Sudden Motion Sensor" technology likewise introduced with the PowerBook G4 -- that allows the iPhone to "know" whether it is being held in portrait or landscape mode and automatically switch accordingly. For example, one might choose to use the device in portrait mode for phone calls and landscape mode for web browsing. In addition to the "self switching" accelerometer, the iPhone has an ambient light sensor -- first introduced with the PowerBook G4 1.0/17" (Al) -- to automatically adjust screen brightness depending on need, and a slick "proximity sensor" to turn off the display when it is held to the ear (otherwise you might accidentally operate it with your face). The iPhone measures 4.5 inches by 2.4 inches, is 0.46 of an inch thick (115 by 61 by 11.6 mm), and weighs a scant 4.8 ounces (135 grams). It features a high-resolution "optical quality" glass 3.5 inch display with 320x480 resolution at 160 ppi. It has 4, 8, or 16 GB of flash memory storage, provides "up to" 8 hours of talk time, 24 hours of audio playback, 7 hours of video playback, 6 hours of web browsing, and 250 hours of standby time. It also has a 2.0 megapixel digital camera. Apple says that the iPhone has just one button -- Home. However, it also has volume up/down, ringer on/off, and sleep/wake buttons. Also see: What exactly is the iPhone? This has been a wonderful information which instantly captured my interest. 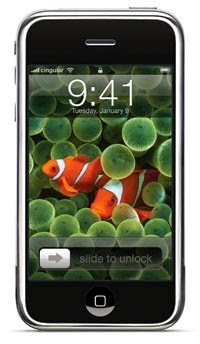 I liked the way you have presented the iPhone specs and created excitement in the mind of people.